With Valentine’s Day just around the corner, it’s the perfect time to show those who are near and dear just how much you care with a treat straight from the heart and fresh from the oven! 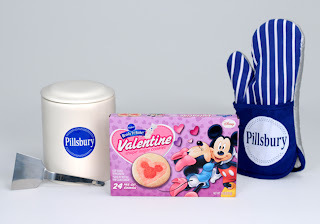 New Valentine’s Day Pillsbury® Ready to Bake!™ Shape® Cookies will fill your home with love and now the magic of Disney®. Whether you bake these cookies for, or with your loved ones, Pillsbury Ready to Bake Shape Cookies are perfect for bringing those you love most together on Valentine’s Day! Quick and convenient, Pillsbury Ready to Bake! Shape Cookies are ready to enjoy in 8-10 minutes and can be found at your local grocer. Bake your way into your family’s hearts this February with new Valentine’s Pillsbury Ready to Bake! Shape Cookies. To spread the love even further, you can visit this link to download a printable coupon for $1.10 off of the purchase of (1) package of Pillsbury Ready to Bake! Shape Cookies today! Disclosure: The VIP coupon, prize pack, information, and giveaway have been provided by Pillsbury through MyBlogSpark. I totally try to put love into the food I make for my family. With boys I'm going to be sharing a lot of love in the coming years! I like to bake and buy special valentine candies! I make a special dinner. I rarely do anything for Valentine's Day- I live half a country away from any family, and I work. A friend and I did invent a favorite holiday called "Post Valentine's Drinking Day" for Feb 15th, though! I send my adult children care packages with candy and other fun things. We spend the day doing one think the other person loves doing that we may not get to do a lot. Cards-- and little gifts in the years when I have extra $$. I always try to bake something fun for Valentines day, such as heart shaped muffins or cupcakes. I try to get them some chocolate!